It’s back-to-school season, so I thought it would be a great time for another Creative + Mindful book report! The last few months flew by and I haven’t had as much time to read as I would like. 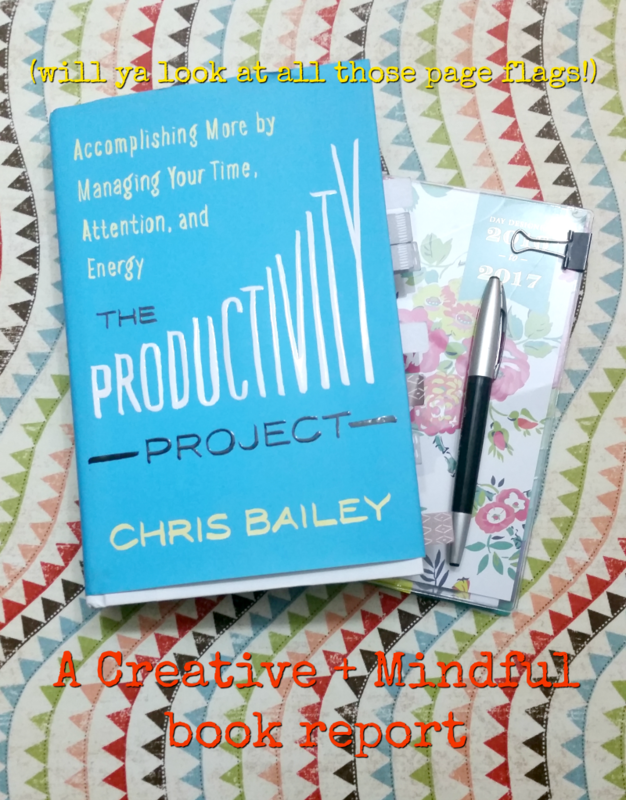 But I did manage to read The Productivity Project: Accomplishing More by Managing Your Time, Attention, and Energy by Chris Bailey. I’ll admit when I first got the book, I was skeptical. Doing more in less time is a big theme in the worlds of entrepreneurship, small business and creativity. I send a healthy chortle and eye roll to books like The 4-Hour Work Week by Tim Ferriss (yes, I’ve read it, so I’ve earned the right to throw shade). No judgement here if the 4-Hour methods are up your alley. But hiring a virtual assistant and outsourcing are not options for my productivity needs. (although, spoiler alert, Chris Bailey does touch on VAs.) I think most of us in the creative arena need much more introspective recommendations. The Productivity Project is well-researched and contains many immediately doable activities. I was pleasantly surprised and all-around pleased at the really useful information the cook contains. In fact (nerd alert!! ), I found myself jotting notes in the margins and highlighting ideas I wanted to come back to. Geeky as I may be, I really don’t mark up my books all that often. The book is broken up into seven sections with each containing 3 – 4 activities. Chris introduces each activity with background information from his research as well as his own experiences. I always like reading other people’s stories for stuff like this. If nothing else, I can compare them to my own experiences. I was also very happy to see that mindfulness and energy management were big themes Chris stuck to in the book. This, of course, generally flies in the face of conventional, super-human, do-it-all, go-go-GO productivity advice. Overall, a great book and one I’m very happy to have in my library!